The death of Florian Afflerbach in a traffic accident has been a devastating new for all the Urban Sketcher community, especially for those of us that met him in person and considered him a good friend. We had the chance to meet him again in Málaga just few days ago and attend his superb workshop 'Car portraits'. After these past days of conversations with him, and still shocked by the sad news, I feel the need to write this post as a tribute to his memory and the extensive legacy he leaves behind. Florian sketching at the Nasrid fortress of Málaga, May 2016. Photo by Javier Rico. It was back in 2009. I was doing some reseach in the internet, looking for images on the subject 'Architectural drawing' while preparing a lecture for the University. Then I suddenly jumped into a whole new world when I found a collection of splendid drawings by Gérard Michel and Florian Afflerbach that were on flickr. The discovery was the gate for me into Urban Sketchers and since then we have exchanged lots of comments and thoughts online about drawing and architecture. Some of our fellow urban sketchers often make friendly jokes about architect's sketches, our obsession on perspective and proportions and the risk of producing well constructed but soulless images. Of course this is not the case of Flaf's drawings, which are not only perfectly built and of the highest elegance and precission but also have a very distinctive style that make them unique, bright and lively. I remember the first time I saw his original sketchbook; I had expected his drawings to be bigger in size and then I found these beautiful jewels so carefully executed and of outstanding perfection that I admire much. This was in Lisbon, at the Urban Sketchers Symposium. We met afterwars in Barcelona, and later at Liège. We talked during all these oportunities and I started to consider him as a good friend. And there would be a fourth time. 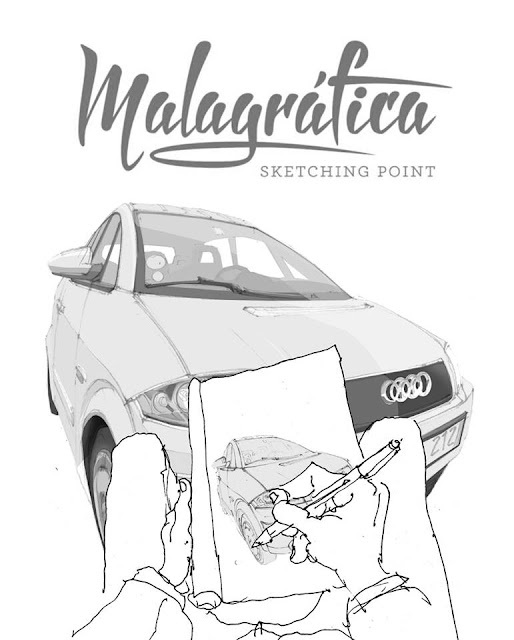 When preparing this year's sketching meeting 'Malagráfica, sketching point' at my city, I was looking forward to bring Florian to Málaga for a workshop on vintage cars at the Museo Automovilístico, and my colleagues Patrizia Torres and Javier Rico also loved the idea. Needless to say that Florian also loved it, and I was really excited to see him at my hometown. I dared to suggest him that perhaps he could give us a chat on his work and life before the workshop, to what he kindly agreed. I am now so grateful that he did, and what he told us becomes now deeply touching, as he lost his life just four days afterwards. I had the chance to translate his words to the participants into Spanish; he spoke about his childhood, when his love for cars was rooted, and explained that 'Flaf' is an imaginary car brand he invented when he was a kid. He showed us his drawings from that time, and later he explained us about his studies on Architecture and his projetcs of the past and the present. He proudly called himself 'the car guy', a nickname someone put him that he loved. 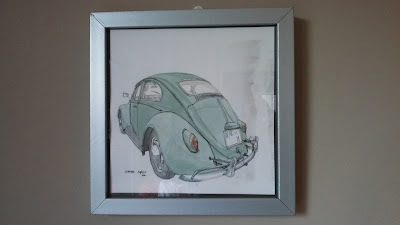 He was becoming more and more interested in drawing old vehicles, preferably on the street rather than at a museum. After that he led a masterful workshop, 'Car portraits'. Everyone was absolutely delighted by his kind explanations and comments -always accompanied with a smile- and he told how happy he was with the results. He even prepared a beautiful booklet for every participant that has become the most precious treasure to each of us now. (At this point it must be said, something that is obvious to those that met him: he was a very gifted man, but above all he was an outstanding person). And of course he drew all the time. His last posts on the internet will remain as a remembrance of his workshop and visit. 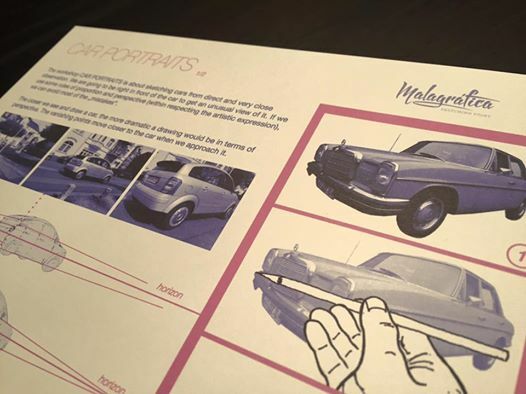 Florian conducting his workshop 'Car portraits' at Museo Automovilístico de Málaga, May 2016. Photo by Javier Rico. I enjoyed our conversations on subjects that we as architects love, to the astonishment of the rest: cross-sections of cathedrals or horizontal thrust of vaults (illustrated by rough sketches on napkins) but we also cheered with beer and the sweet wine of my city, together with our respective partners. It is incredible this all happened less than a week ago; now these bittersweet memories will remain in my mind for ever. About a year ago he suggested a drawing exchange between us. He asked for a ship sketch, and of course I got a car one in return as I desired. 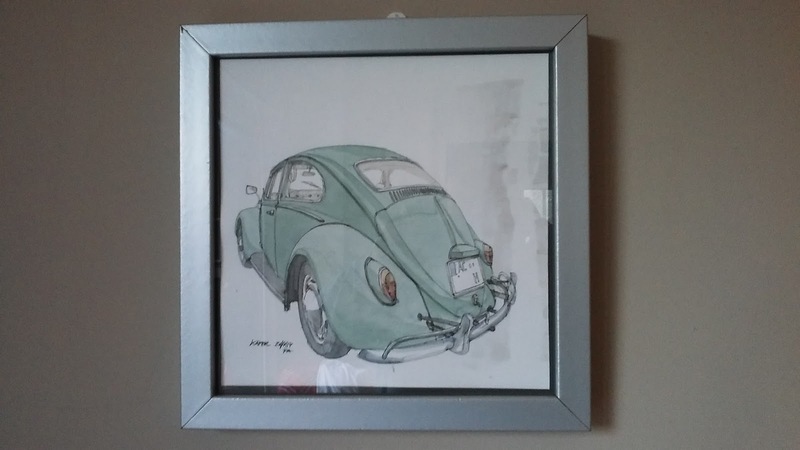 Since then, a VW Beetle hangs on the wall of my living room and reminds me of Flaf every day. Sit tibi terra levis, my friend.